This specialised tribute represents the Gates of Heaven and is based in white chrysanthemeums and edged in a colour co-ordinated ribbon. The spray on the side of the Gates includes a mixture of flowers such as Roses, Lisianthus, Spray Carnations and foliage,there is a single rose on the arch to complete the design. This is a freestanding design and can come in a variety of colours, please specify the colour of the ribbon and flowers you would like. 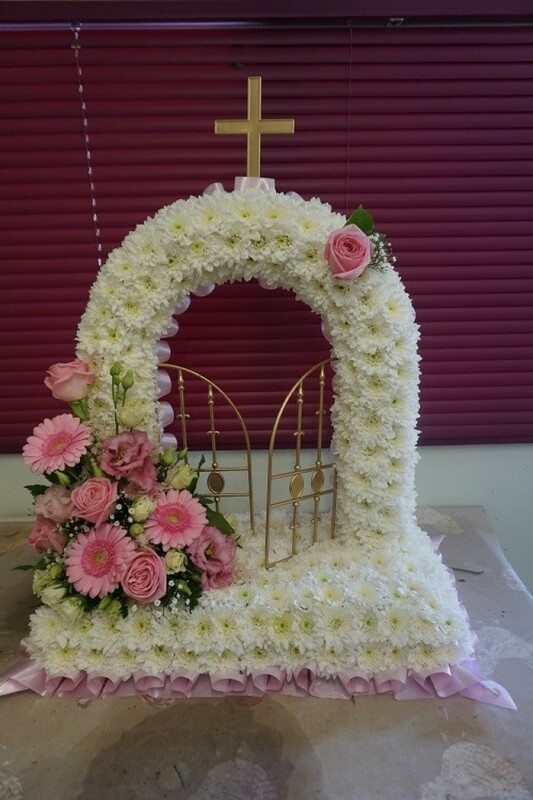 This stunning floral display has been arranged in water retaining foam (oasis) to ensure maximum freshness. Our flowers at Sarah Coxon Floral Design arrive fresh from the Dutch auctions every day so you can be rest assured we are using the best quality of flowers available.